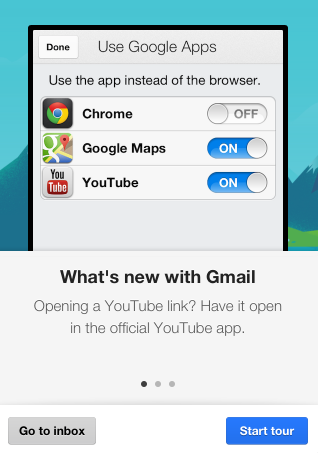 The latest version of the Gmail app for iOS added a feature that opens links using other Google apps: Chrome, Google Maps and YouTube, assuming you've already installed them. It works well for Google Maps links and YouTube links, but not that well for other links: some open using Chrome, but most links open using the internal browser of the Gmail app. If you don't like this feature, you can disable it by tapping the settings icon next to the account switcher, picking Google Apps and unchecking the apps you don't want to handle Gmail links. 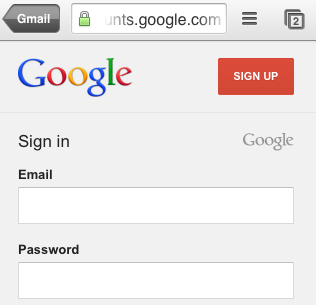 You can't change the default browser in iOS, but some Google apps include an option to use Chrome. For example, the YouTube app opens all the links using Chrome, if you've installed the app, and you can disable this feature from the settings. When you open a page from a Google app like YouTube, Gmail or Google+, Chrome shows a button that sends you to the previous app, just like the Android back button.